The Academic Calendar lists the important dates for the rest of 2018-19. The list includes dates about the quarters, holidays, when grades are due and when you can expect to review them. Find it here. If you have any questions about degree requirements and study plans email AcademicCounselor@jfku.edu, or book an appointment online by logging on to BlackBoard – Office of Student Experience – Meet your counselor. For accounting questions, call 925-969-3160, email accounting@jfku.edu, or refer to the Managing Your JFKU Account Online – step by step guide. 2018-2019 Academic Catalog is available for viewing and download on the JFKU website. New student orientations were held on ground at the Pleasant Hill campus and online on September 20th and September 29th. Thank you to all the students who attended the sessions! We had a record high turn out for our on ground orientation — 51 students participated, as well as on the online orientation –39 students participated. In addition to getting to know each other, Dr. Julie Cosenza, academic counselor, led an optional activity called Hopes and Fears, whereby students anonymously shared their hopes and fears about starting their program at JFKU. Thank you for sharing your thoughts with us and other students. It helps us connect better with you, as well as for you to connect with other students starting a new stage in their lives. Congratulations on starting your program and a new phase in your career! To those of you who attended, we’d love to hear your feedback as to how we can improve our orientation sessions for incoming students in future terms. Please take a few minutes to fill out the Student Orientation survey. If you are a student that is returning to JFK after taking a break, or if you missed our Fall 2018 new student orientations, we encourage you to watch the interactive New Student Orientation video to learn how to navigate the BlackBoard Learn and SOAR portals, register for classes, access important academic information and valuable student services and resources. To access the video navigate to BlackBoard – Office of Student Experience – New Student Orientation (on the left hand menu). Email us at academiccounselor@jfku.edu with any questions. 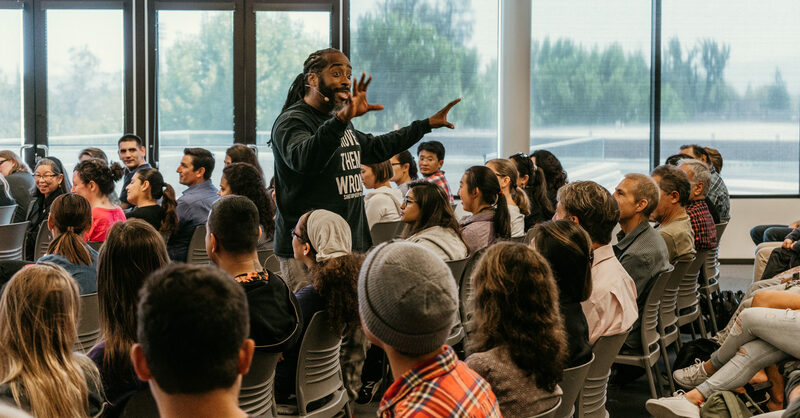 In collaboration with DVC, and the Speaker Series sponsored by the HSI Grant, JFK University brought poetic voice Sekou Andrews to motivate students to take action in furthering their education to achieve their goals. Sekou performed at the DVC campus for an audience of 150 DVC and JFKU students and faculty in a presentation entitled “Tu futuro está en tus manos/Your Future Is In Your Hands” on September 19th. SGA also participated in the sponsorship of the event. The University now provides accessible Kurzweil Software (pdf reader). This assistive technology was developed to guide students through the learning process and facilitate the processing and articulation of new concepts.. For more information, contact OAS at 925-969-3362 or visit kurzweiledu.com. The University now provides Dragon Naturally Speaking, a speech recognition software (voice to text). This software has the capability to execute commands as well as record text. The software allows the student to speak into a microphone on a computer with software translating the spoken words into text in a text program (text program, microsoft word). For more information, contact OAS at 925-969-3362 or email Access@jfku.edu. disabilities. Virtual Career Fair Date: November 14, 2018, register at CareerEco.com/Events/Disability Or call 770-980-0088. Follow My Lead - Alumni/Community Referral Scholarship Do you love your program, faculty and friends at JFKU? Refer a friend to one of JFKU’s degree programs and they will receive a scholarship upon enrolling. With support from a Hispanic-Serving Institution (HSI) Grant from the Department of Education, the Undergraduate Success Center offers a need-based electronic lending library of laptops, Surface Pro tablets & voice recorders. The service is available to all JFKU students who are enrolled in classes in the current term and need the equipment to complete assignments. To apply, read the step by step instructions on How to Borrow Equipment from the USC Lending Library. Tutors are available on-call/by appointment at the Undergraduate Success Center, room S228 at Pleasant Hill, or online via the Tutoring Virtual Room on BlackBoard collaborate at the times specified below. Legal Technology Tutor – Henry Tran: Mondays through Fridays 5pm to 9pm. Saturdays 10am to 4pm. Statistics/Math and Computer Tutor – Jesus Milian: Mondays through Thursdays 5:30 pm to 6:30 pm. To book an appointment go to BlackBoard – Office of Student Experience – Undergraduate Success Center – Tutoring Services. If you have a time conflict email hsi@jfku.edu to inquire about alternative tutoring hours. Joyce Young, Writing Consultant is available for appointments in Pleasant Hill and online via email and ZOOM. View the schedule and book appointments by logging on to BlackBoard – Office of Student Experience – Writing Center. Room S202, Pleasant Hill or via this ZOOM link-Join from PC, Mac, Linux, iOS or Android. and when to use them. Academic Counseling at Pleasant Hill and online: View the schedule and book appointments by logging on to BlackBoard – Office of Student Experience – Meet your Counselor. Learn more about Joyce’s new book by visiting the Nomadic Press website and the SF Chronicle Sunday Datebook. Don’t forget! October 22nd is the deadline for registering to vote in the upcoming November midterm election. Go to jfku.edu/events for the latest information. International Pronouns Day is October 17th. This international commemorative day seeks to make asking, sharing, and respecting personal pronouns commonplace. Referring to people by the pronouns they determine for themselves is basic to human dignity. To fully understand why pronouns are important we must be more conscious of language, concepts and queer cultures. To support our community to develop a foundation of knowledge, support non gender conforming members of our academic community, and celebrate people’s multiple, intersecting identities, JFKU will be holding awareness activities during the time leading up to International Pronouns Day, and on October 17th. Presentations will be held for faculty and staff in the September Staff and Faculty senate meetings. A brown bag lunch seminar will be held for faculty, staff and students on Wednesday, October 17th. More information will be shared about planned activities in the coming weeks. For more information contact Dr. Benisa Berry, Diversity and Inclusion Officer at bberry@jfku.edu or extension 3572. Are You Reading This Now? Give Us Your Feedback about the Student Newsletter! To help us give you the best and most useful content, please take this quick survey to give us your feedback about this Newsletter.